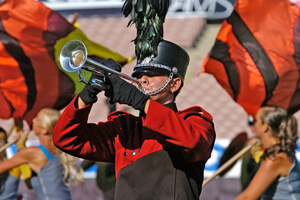 The DCI World Championships went to California for the first time in 2007, with the Division I events held at the historic Rose Bowl Stadium in Pasadena. The class had a new face that year in the Academy, which moved up after winning the Division II Championship in 2006. During its tour, the corps caught many other units off guard and even knocked eventual World Championship Finalist Spirit of JSU out of the Finals competition at the DCI Southwestern Championship. Academy went on to finish 10th in the night show in San Antonio, also topping Pasadena finalists Colts and Glassmen. One of the biggest stories of the year was the season-long march of the Madison Scouts up through the ranks. During the tour, Crossmen, Pacific Crest, Cascades, Southwind, and Troopers all beat the corps; but Madison would top them all at the Rose Bowl to finish 15th. Crossmen made news of its own with the corps' transcontinental move from the east coast to Texas. Despite a shortened touring schedule, Pacific Crest held on to beat Cascades by 0.65 in the Quarterfinals to grab the last Semifinals spot. 20th place Troopers came back from a year of inactivity with 64 brass players, generating some of the loudest applause heard all season just by walking onto the field. The Academy finished 13th in Pasadena, one point under Spirit and a coveted finalist berth and just 0.15 ahead of Blue Stars. The corps' show, "The Chase," was inspired by the cinematic era of 1940s crime films and was a wild ride through an urban soundscape that was part classic, part contemporary. The passion of the music captured the thrill of the shadowy world of a big city, where greed and dishonesty trumped kindness and respect, emotions overtook reason and countless residents became intertwined with each other's fate. Three main characters were portrayed throughout; a hero, a shady villain and a woman love interest, each trying to control the outcome. Corps arrangers Sam Pilafian and Patrick Sheridan contributed the mostly original music, also utilizing Joseph Turrin's "Hymn for Diana," a brass band work written within a week after the 1997 funeral of the Princess of Wales. VIDEO: 2007 Academy color guard members explain their roles in this production. "The Chase" began with a selection of the same name, a torrid work that was sinister and foreboding, conjuring musically and visually the sense that there was danger about to go awry. A lot of stinging stabs by the brass section and pulsating percussion raised the intensity level to near boiling. "The Villain" was next, highlighting said character with a repetitive bass figure under some jazzy outbursts. As was often the case in the old black and white movies, the villain was dressed in gray clothing. "The Hero," dressed in white, featured a few percussion breaks and a melodic line that was dramatic in an appropriately heroic fashion. "The Woman" started with a steel drum into and featured a lead character in red. Whether she was good or not was not important—She was the object of desire of both the hero and the villain. "At The Jitterbug Club" was pretty much as the title sounds, a good-natured romp on a dance floor. It was reminiscent of 1940s jazz, like a hot Artie Shaw or Benny Goodman tune. The corps had a lot of fun with this piece, with the horns blaring away and the dancers letting down their hair. The woman character definitely preferred the villain during this segment, a fact that didn't go unnoticed by the envious hero. "Hymn for Diana" was the entire basis of "The Love Theme," changing the mood and letting the hero and woman engage in a tender balletic duet. Of course, the drill in the horns and drums had to include a giant stationary heart shape at the musical climax. It appeared that although the woman preferred to spend her nights dancing until daylight with the villain, she preferred spending her days with the hero. "The Chase/Conclusion" started with the villain breaking apart the two lovers, the opening strains identical to those that began the show. The drill was also practically an exact mirror image, at the right side of the field instead of the left side of the opening entrance. At the end, the hero got the woman and the villain was surrounded by a block of brass players who turned to him as soon as the last note was cut off, raising their arms as if saying, "You're not going to get away from us." For this week only, you can save on the DVD that contains this complete Academy performance, along with all of the 13th through 22nd placing corps at the 2007 DCI World Championships. Buy the 2007 Division I Volume II World Championship DVD. (Available this week only for 20% off. Regular price: $29.95.) Discount DVD offer ends Monday, Feb. 11 at 8:30 a.m. ET.